There's been some talk amongst health professionals and people dealing with diabetes about bitter gourd (more commonly known as bitter melon) and its anti-diabetic properties. They state that bitter melon contains saponin and "plant-insulin" which lowers blood sugar levels. It is proposed that bitter melon inhibits the enzyme that breaks down disaccharides (two-sugar molecules, such as lactose in milk) to monosaccharides (one-sugar molecules, such as glucose), thereby reducing the amount of glucose released into the blood stream. Okay enough of the science, let's move on to the actual food! Bitter melon is quite a common summer vegetable in Japan, especially in the Okinawa region. Yes, Okinawa the Blue Zone. The most common dish is called Go-ya Chanpuru (pronounced "Goh-Ya Chan-poo-roo"), which means "stir-fried bitter melon". How simple. 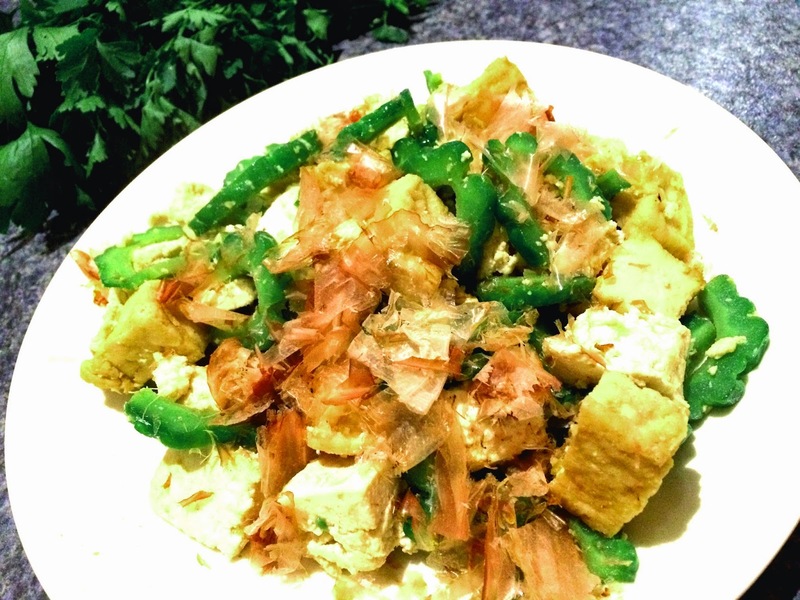 It's a stir-fry using thinly sliced bitter melon, tofu and egg. Seasoned with soy sauce and garnished with bonito flakes. Halve bitter melon length-wise and slice thinly (horizontally). Rub in a pinch of salt and let it sit for about 10 minutes. Rinse with water and drain excess (or use paper towel to squeeze out excess). If getting rid of the bitter-ness isn't good enough, then let's make bitter melon sweet like sugar. Buy a bitter melon (or two). Leave it on the bench for 3-7 days until the outer skin goes completely yellow. Open bitter melon (cut length-wise) and check the seeds: If they are bright red, then they're ready to be eaten. The picture above shows a somewhat ripened bitter melon. But this is only half-way in reaching its full sweetness. 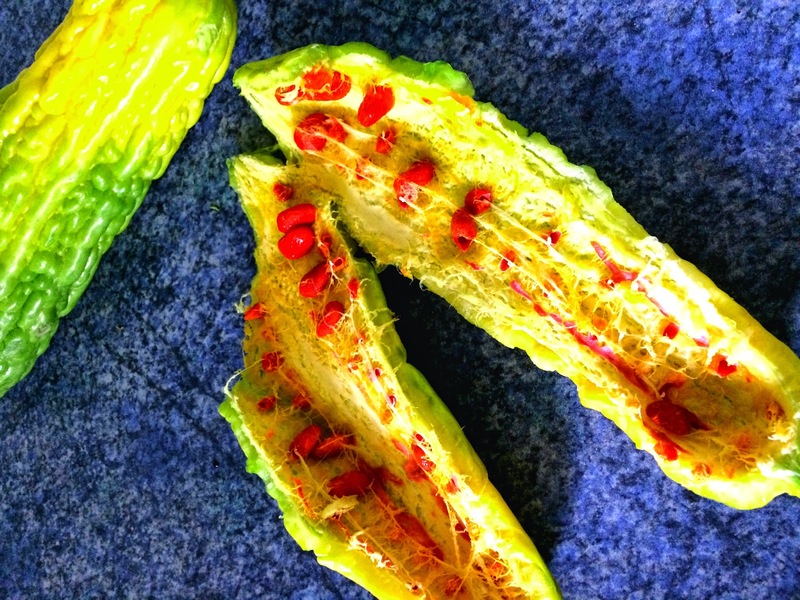 The ripe bitter melon may scare you at first because (1) it's super soft and will feel like it's rotten and (2) the seeds are really really red.